Prominent & Leading Exporter from Ahmedabad, we offer kirschner wire. Our in depth industry knowledge and profound technological expertise of manufacturing, supplying, and exporting wide spectrum of External Fixator have enabled us to offer Kirschner Wire. These are made by using ultra modern technologies from the highest grades of metal alloys in our state of the art manufacturing facilities under hygienic and sterile conditions. 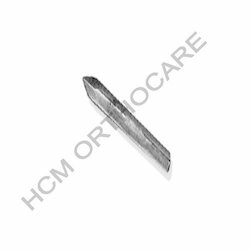 These are used extensively in orthopedic surgeries to hold together bone fragments by leading doctors across the globe and are acclaimed for their outstanding features. These are dimensional accuracy, application specific design, and so forth. Our valued clients are offered these at industry leading prices. Looking for External Fixator ?